Everyone likes to learn about crazy new facts they haven't heard of before. In the game The Sci Or Fi Files you'll be tested to see if you know the answer to some pretty interesting multiple choice questions. This game is as educational as it is entertaining. The Sci Or Fi Files has a few tricks up its sleeve so you'll want to read through the game rules and instructions listed below to learn exactly how to play. There is a little bit of strategy in this game as you can take different kids of risks. Switch things up next game night and give The Sci Or Fi Files game a try. The first player to collect 1 score chip from each category wins! 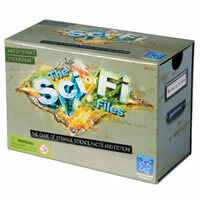 The Sci Or Fi Files comes with 200 playing cards, 4 category divider cards, 18 answer cards, 32 score chips and the official The Sci Or Fi Files game rules and instructions. Paper and pencil are required but not included. Please keep in mind that the official The Sci Or Fi Files party rules and instructions could be different depending on the game version you have. The rules below are some of the exact directions on how to play The Sci Or Fi Files. Share with us your comments, funny stories, tips, advice, strategies, creative ways to play, questions about how to play, problems with the rules or anything you want about The Sci Or Fi Files. All submissions will be reviewed within 24 hours. Click here to add your The Sci Or Fi Files comments.